It's difficult when a device, especially one made by an American manufacturer, is released in Europe six months before it comes out in the States. Palm has a loyal following here in the US, but when they make fans wait half a year, will those fans hold out or will they opt for something younger and sexier? Although Palm worked hard to trim some weight (and the antenna) from the new Treo 750, it still looks large and outdated when compared to the plethora of new thin Windows Mobiles that launched in the second half of 2006. However the Treo features several innovations that give it a leg up over the slimmer devices. After reviewing a number of the most recent QWERTY smartphone, we've developed certain size and weight expectations for a Windows Mobile device - especially a monoblock one - as opposed to the slide-out style of the Apache, Wizard or Hermes. 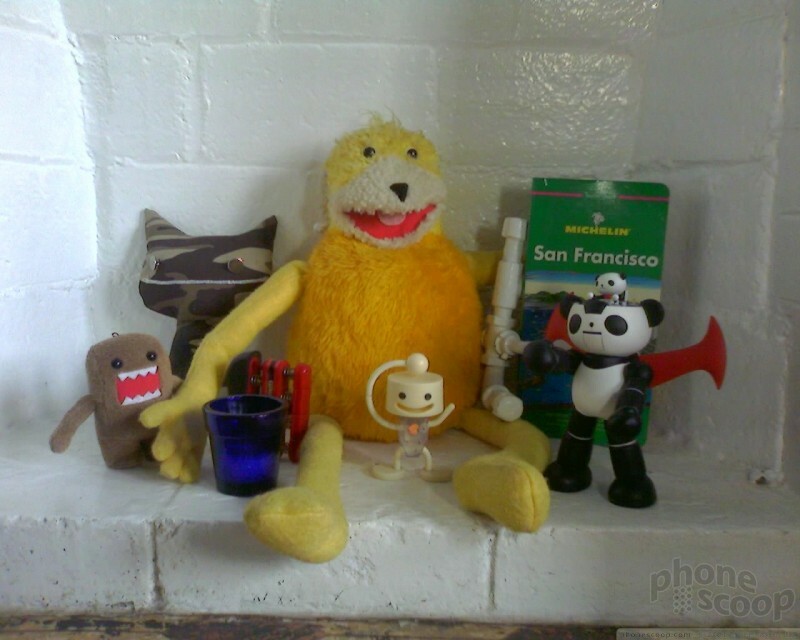 The first thing that struck us was the weight of the Treo. It feels about twice as heavy as the BlackJack, Dash, Q and other slim QWERTY smartphones. However, everything is relative. The first time a current Treo user picks up the 750, he will probably say "wow, this is really light," as many Treo users we know did. For as heavy as the Treo 750 is, it is actually about 20% lighter than the 650 or 700. The 750 is a pleasure to hold in one hand to talk on the phone. Although it is thick, it is also narrow and has a nicely rounded transition from the sides to the back. The smooth rounded shape and rubbery finish are a pleasure to wrap your hands around. The sides are concave and made of a hard, smooth plastic, which should allow you to grip the phone firmly even if your hands too small to wrap around the Treo. 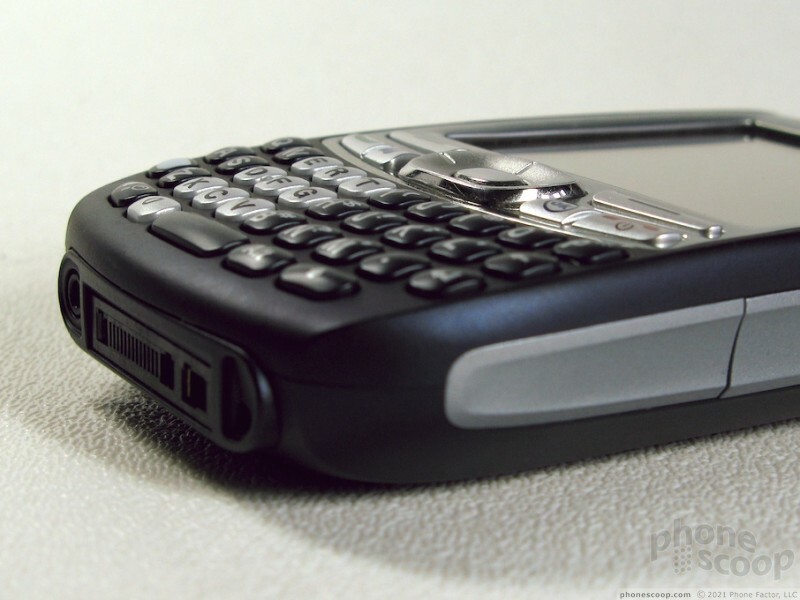 Although the Treo is well-designed for one-handed use, it is not nearly as comfortable when held in two hands to type, even though there are not any hard plastic corners or other bits that poke you. Instead the problem is one of balance - the Treo is so heavy - and the keyboard so short - that when you try to type two-handed, more than two-thirds of the length - and weight - of the Treo are hanging up in the air. Over time we learned to hold the Treo differently than we would any other QWERTY phone to balance the weight, but this did not make up for the weight or the cramped keyboard. Although the Treo's keys are small, they have a very nice rounded, convex shape and enough space in between each key that you should be able to feel out keys and type quickly. Unfortunately, this isn't the case in real-world usage. 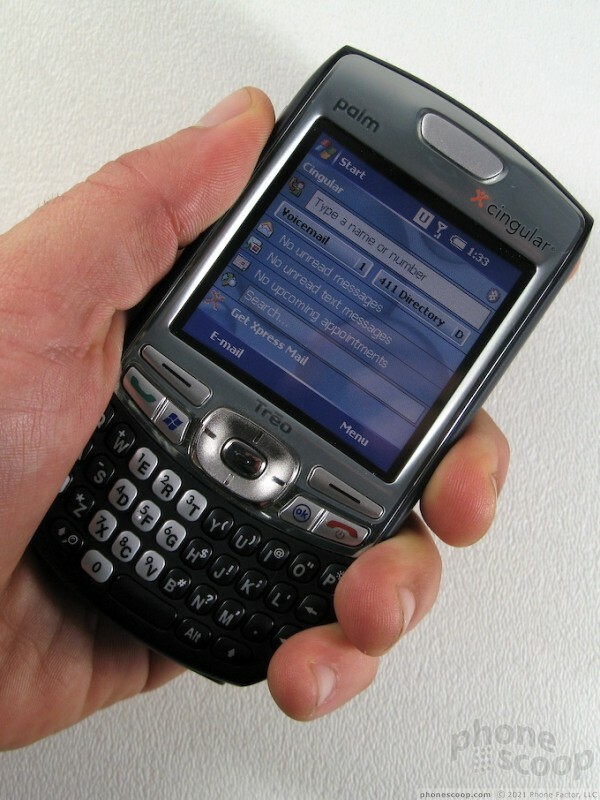 When tapping out messages, we made far more errors typing on the Treo than we normally do. Although you can feel each key below your thumbs, they are small enough and spaced tightly enough that your thumb winds up resting on more than one key at a time when typing. If you don't press straight down, or if your thumb is off center slightly, it is too easy to press a neighboring key instead of your intended target. The navigation cluster remains largely unchanged from previous Treos. The D-pad is large and very easy to control. The send and end keys have been enlarged at the expense of the Windows and ok keys, however all four are easy to press, and tough to mistake for one another. The 750's screen is bright enough to be read in most lighting conditions. It even does fine in bright sunlight as long as it is shining directly on the screen. However it is not bright to see on sunny days if the screen is not lit by the sun. Because of its low 240x240 resolution, the screen looks a bit blocky, or pixelated. But at least the touch screen uses modern technology that does not further degrade the visual quality. Until recently the addition of a touch screen would have clouded the screen with a grey textured film that would have made the Treo unusable. Although the screen is easy to read, it is simply too small for such an data-heavy device. 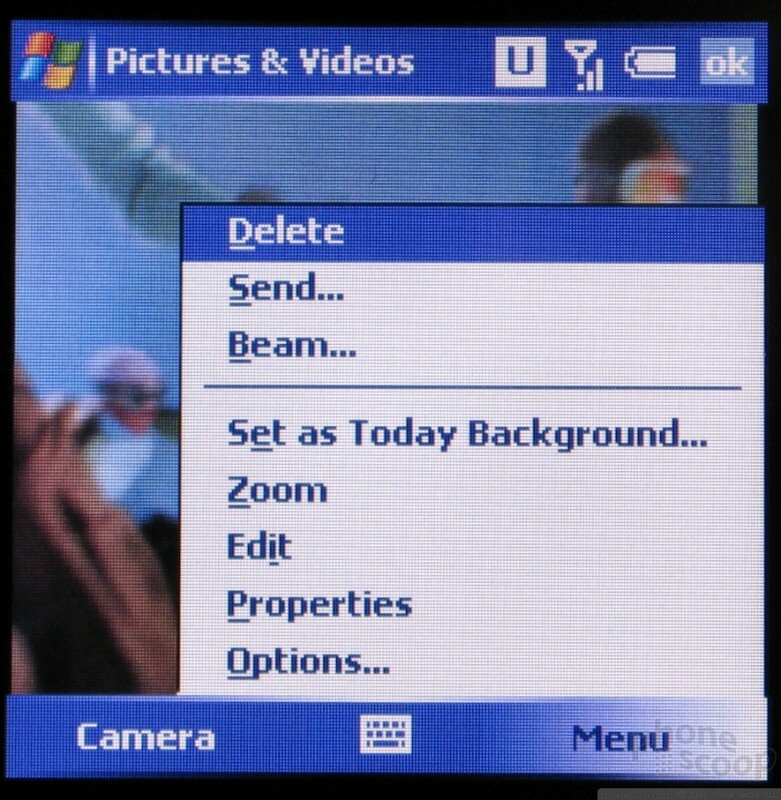 Microsoft and Palm have tried their best to maximize the information shown on the screen, but without a complete redesign of Windows Mobile, these efforts fall short. 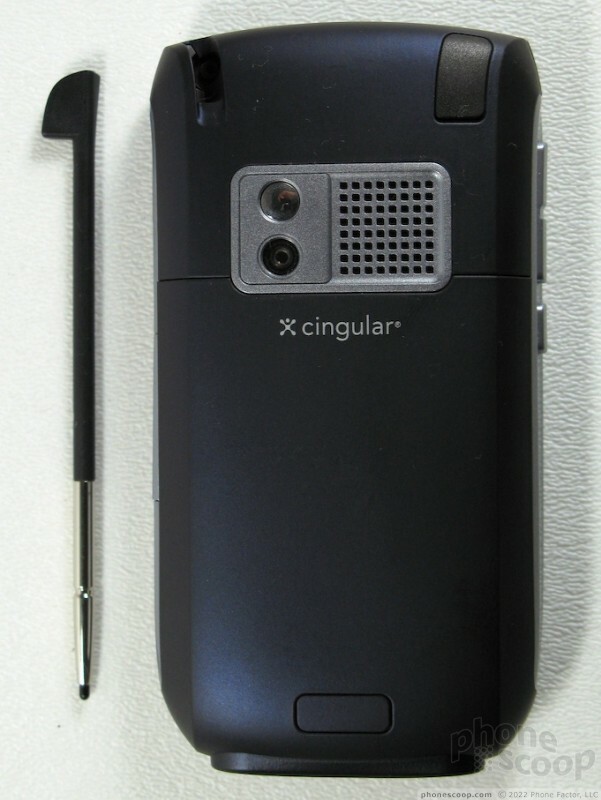 If we didn't test so many other Cingular phones, the 750 would make us seriously doubt Cingular's claims about having the fewest dropped calls. In one 20 minute period our Treo dropped at least 6 calls while displaying full strength in an area we know has excellent coverage. Over the course of our test period, the Treo would drop calls randomly but not at an exceedingly high rate. 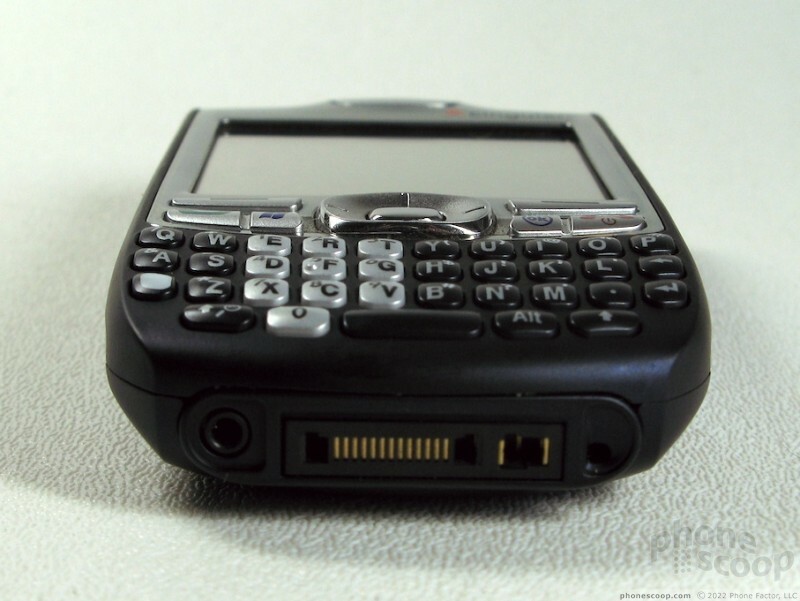 However every time we returned to the original problem spot, the Treo would drop calls without fail. To be sure this wasn't a network issue, we even switched our SIM to a different phone and were able to make calls in the exact same spot without them ever dropping. We checked with Palm and with users in our forums and others and no one else was having this problem, so we suspected we had a defective test SIM or device. 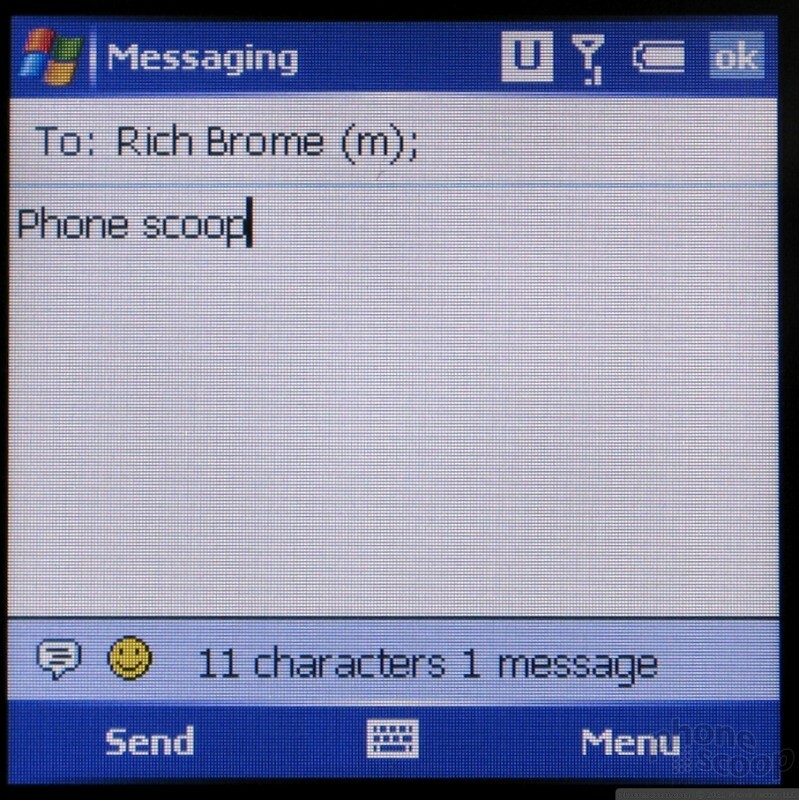 We swapped SIMs and the Treo still dropped calls. We asked Palm for another Treo, worried ours was defective and still the dropped calls continued with the replacement. 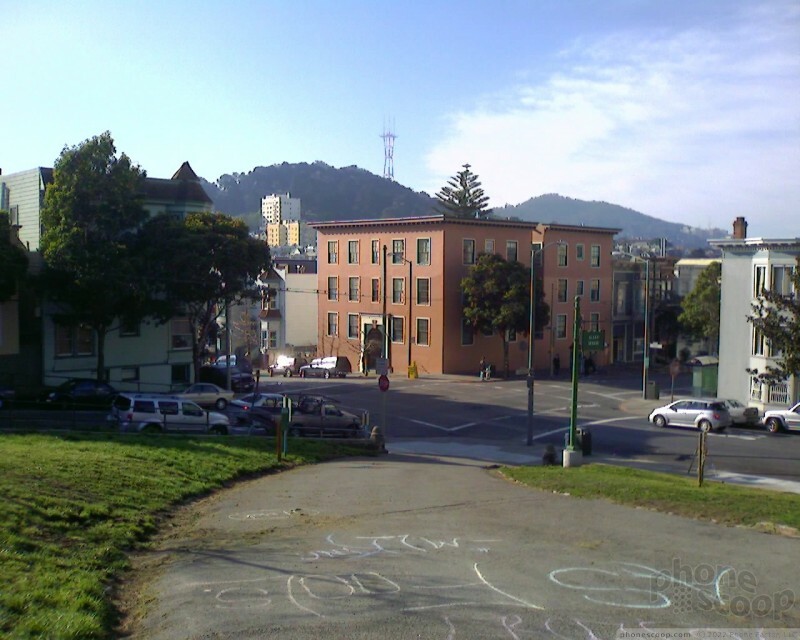 We can only assume that since no one else has reported an issue, but since it was consistent for us, that the Treo 750's problem is limited to the network in San Francisco. 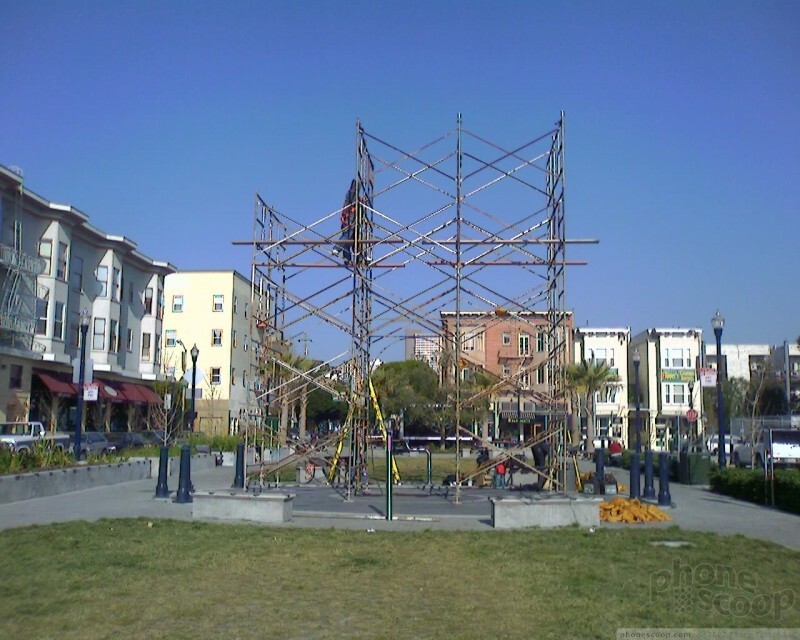 However there may be other parts of Cingular's network that are configured similarly and we would expect the Treo to have similar problems there. 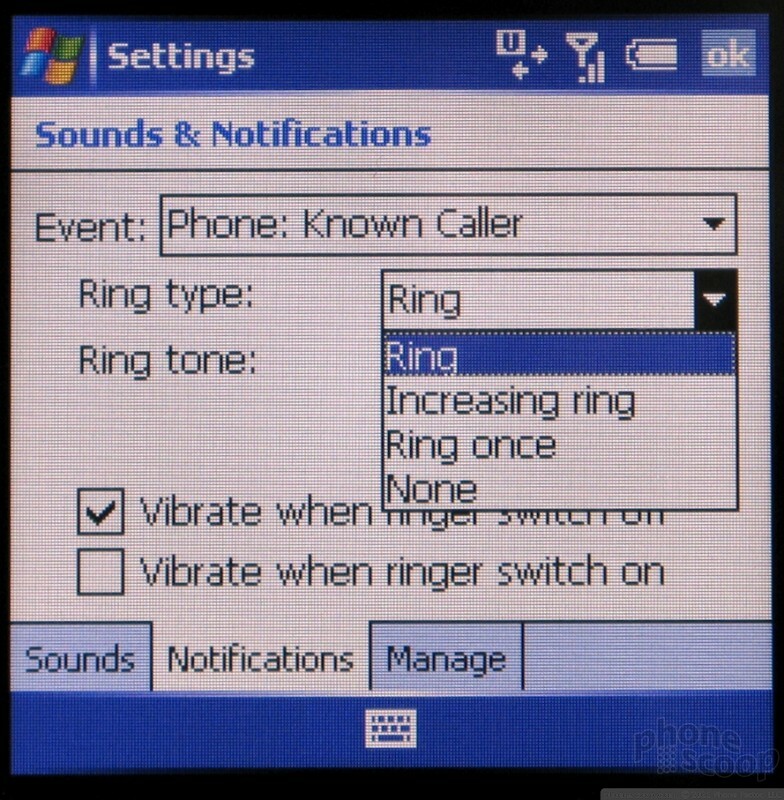 These problems were limited to voice calls. We had no problem with data calls dropping. Nor did the Treo have any problem passing the vault test. The problem was not signal strength itself, the antenna is obviously quite good. The sound quality of the Treo in a call is among the best we've tested. Nearly every person we spoke to on the phone said they've never talked to us on a better sounding phone. And on the listening end every call was loud and clear. So loud, in fact, that we rarely used the 750 at anything above the lowest volume - even outdoors. The ringer and speakerphone are loud as well, however not nearly as loud as the speaker. We had to turn the ringer volume to halfway just to hear it in a quiet room, and almost to its maximum to hear it outdoors. Unfortunately the vibrating alert was too weak to get our attention in situations where the ringer had to be turned off or wasn't loud enough when it was on. Considering the size of the Treo in comparison with similar smartphones, we expected a longer battery life than those skinnier models, and the 750 lived up to expectations. Battery life was generally two and half days with regular use, however that was without checking email automatically every five minutes. If you prefer to have your email updated automatically, we're told you can expect just about two days. Leaving Bluetooth on also affects battery life enough to notice, but not terribly. 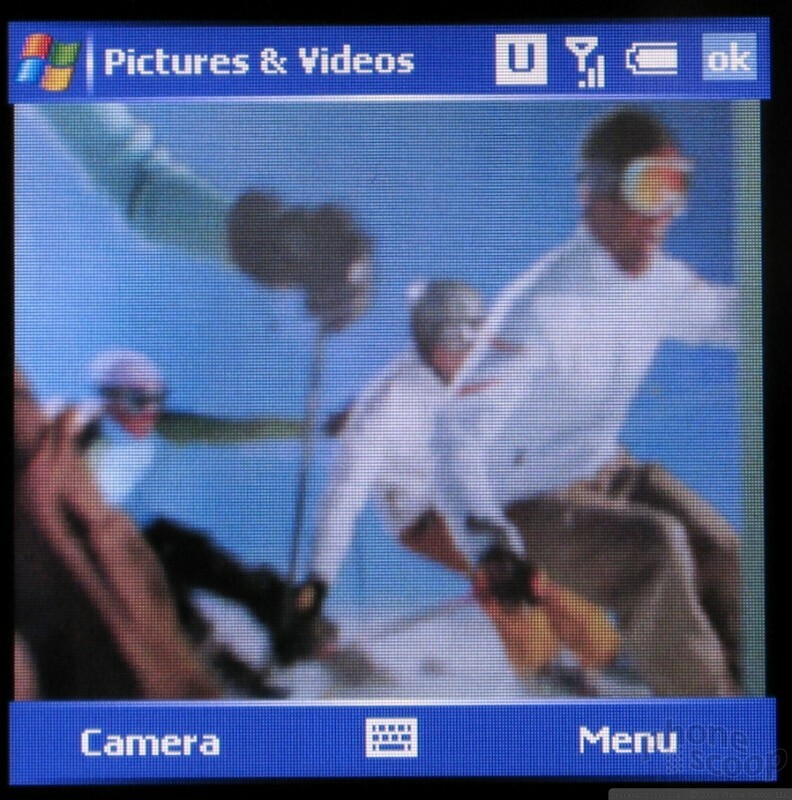 The Treo 750 runs a slightly updated version of Windows Mobile 5 Pocket PC Phone Edition. We previously reviewed this operating system on the T-Mobile MDA and other phones. 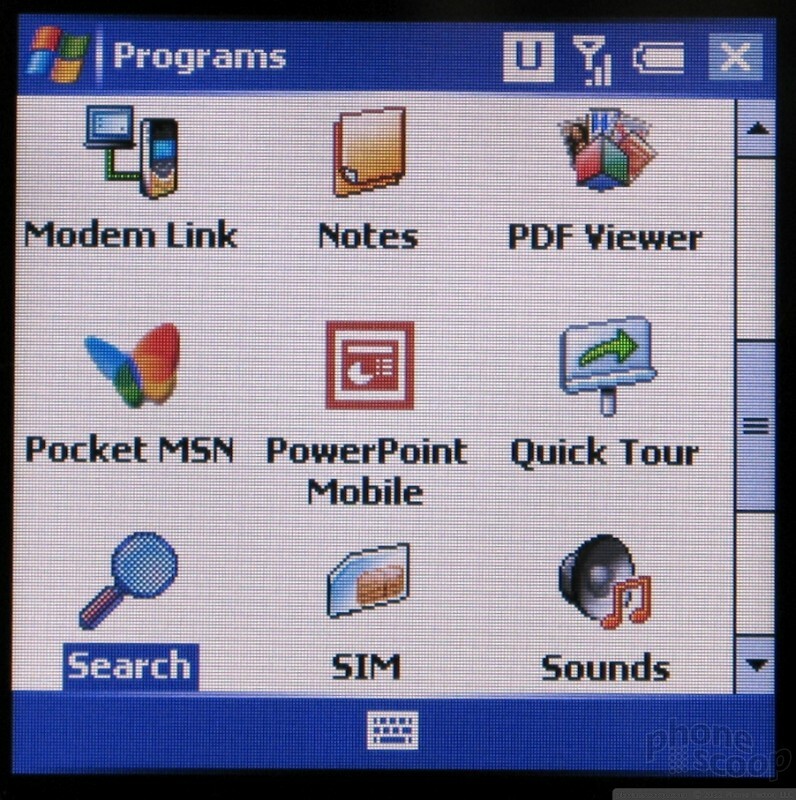 Much of what follows is similar to previous Pocket PC Phone reviews, however we have made changes where either Palm or Microsoft has updated the software. 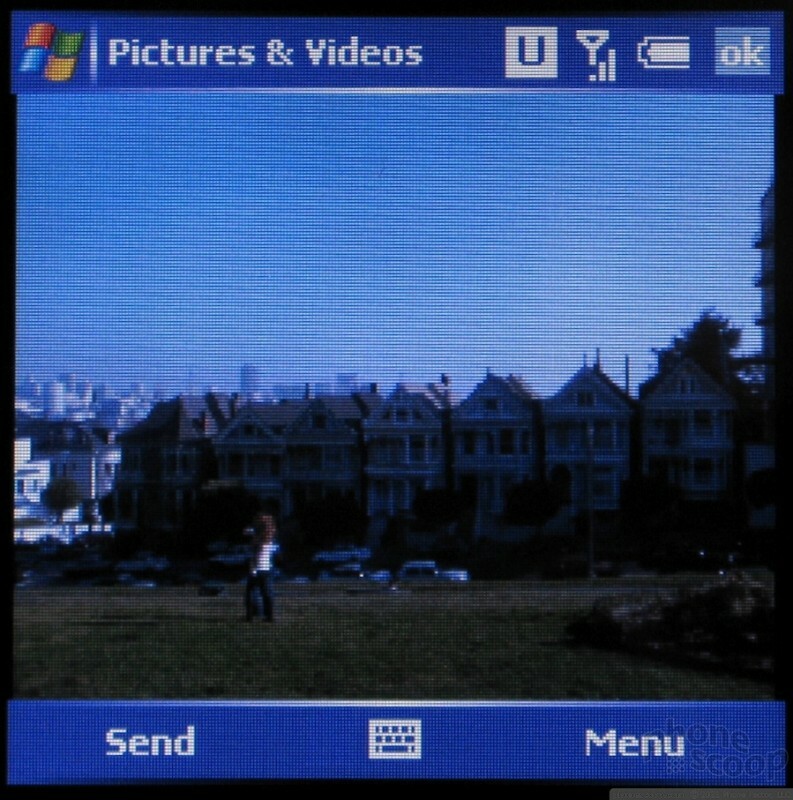 For Windows Mobile 5, Microsoft made Pocket PC more Smartphone-like. 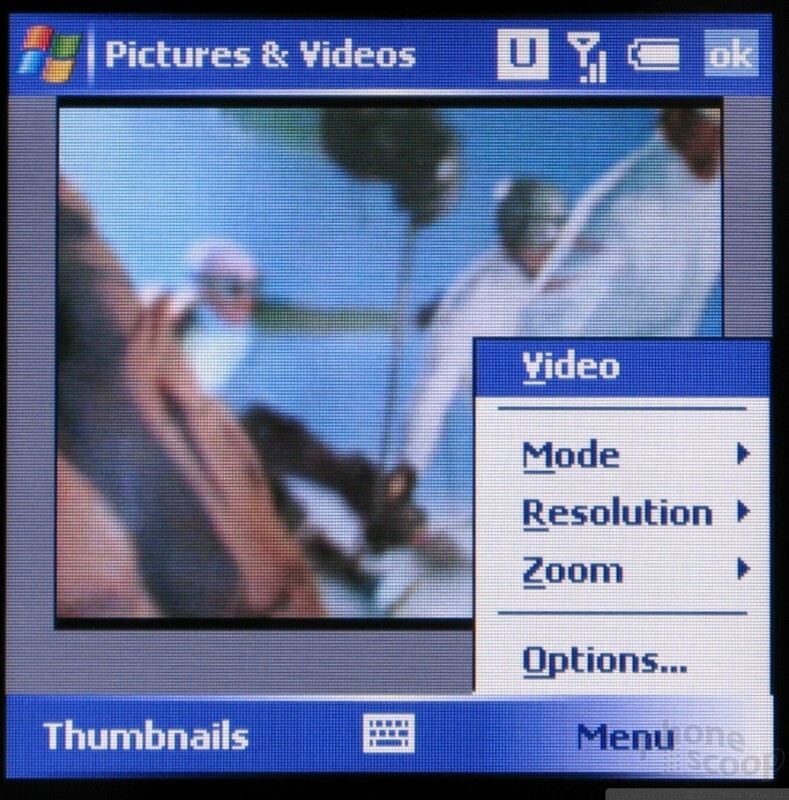 They have redesigned the menu system so that many functions use the two soft keys like a Windows Mobile Smartphone would. Soft key options can be chosen either by pressing the associated hardware button or by tapping on the label on the Treo's screen. 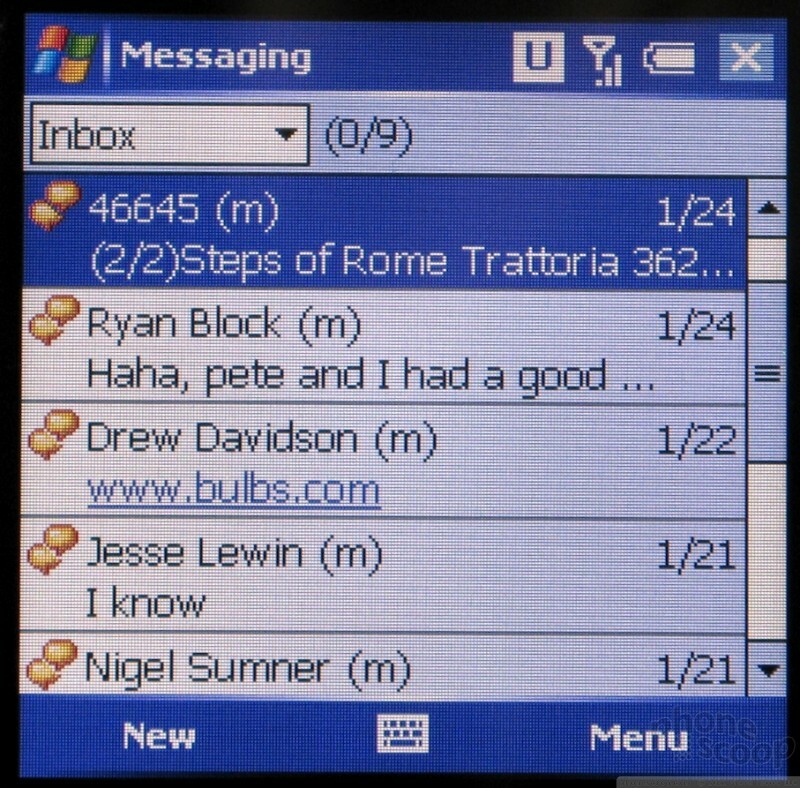 The Treo 750 also adds Windows and ok keys to futher reduce the need to tap the screen, however the effort is half-hearted. There are still boxes and buttons and tabs scattered throughout applications and preference screens that cannot be dealt with except using the stylus. The home screen is completely customizable; not just the wallpaper or color scheme, but what information is displayed as well. 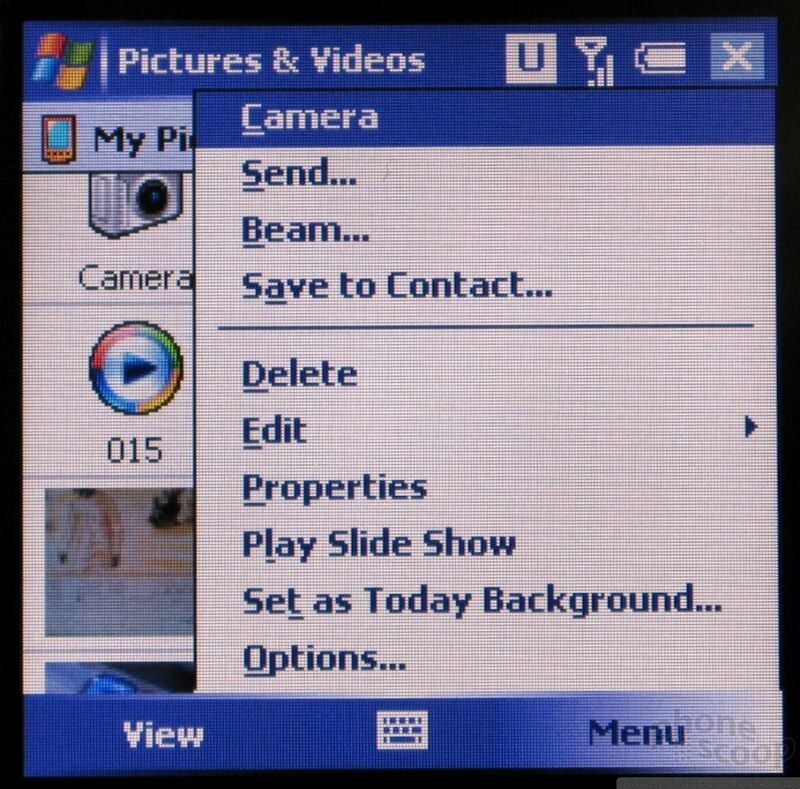 The Treo ships with a custom theme that offers shortcuts to many oft-used functions, as well as a custom plugin that emulates Windows Mobile Smartphone's smart dial feature. There are hundreds of applets available online that can customize what is displayed on your home screen, and a number of color themes are available as well. The information displayed on the home screen acts as a shortcut to the associated application. Applications can also be accessed through the Start menu by tapping the Windows flag. Just as on a Windows desktop, applications can be placed in the top level of the Start menu or in a separate Programs screen. 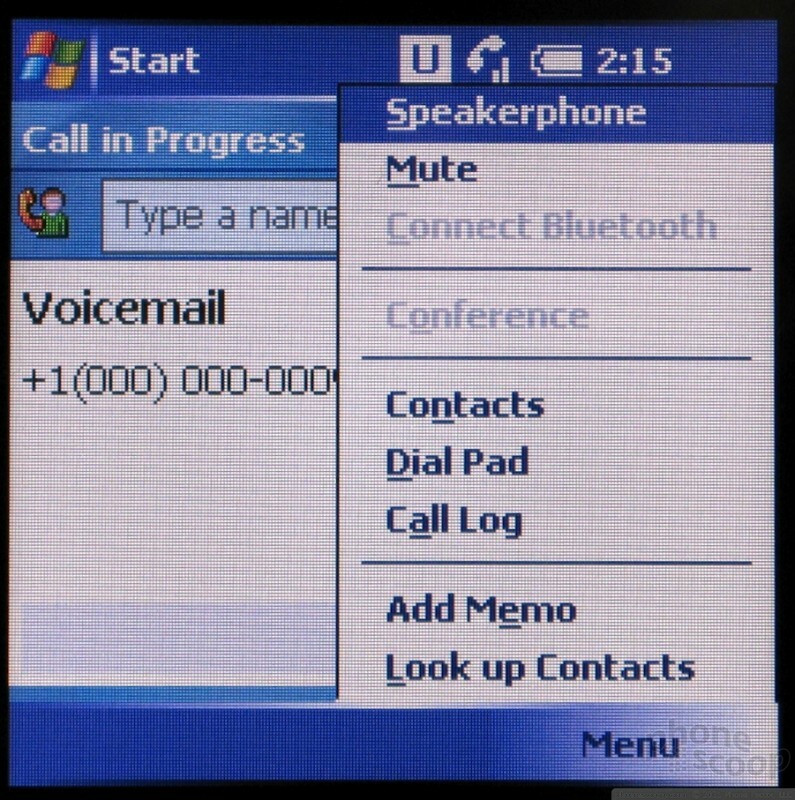 Once inside an application or when making a phone call, the most common action is assigned to the left soft key, and the rest of the menu options are available through the right soft key. In-between the two soft key labels is a small icon to activate on-screen text entry. 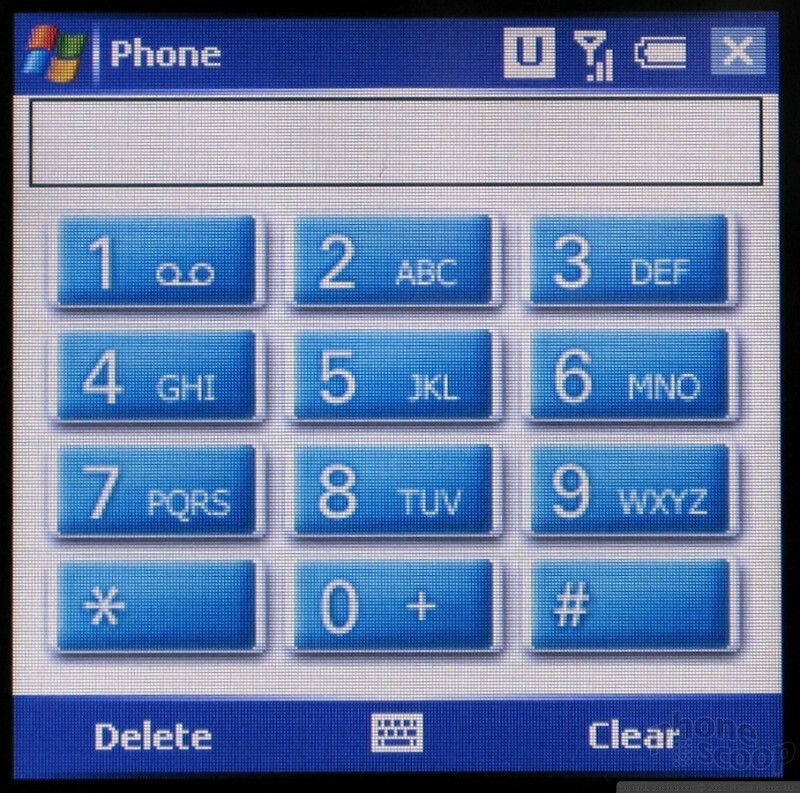 Everything from a tiny QWERTY keyboard to a numeric keypad with T9 to traditional handwriting recognition is available, in addition to the obvious - the QWERTY keypad below the screen. The soft keys and text entry menu are consistent from application to application. However things as simple as closing an application are not as clean. 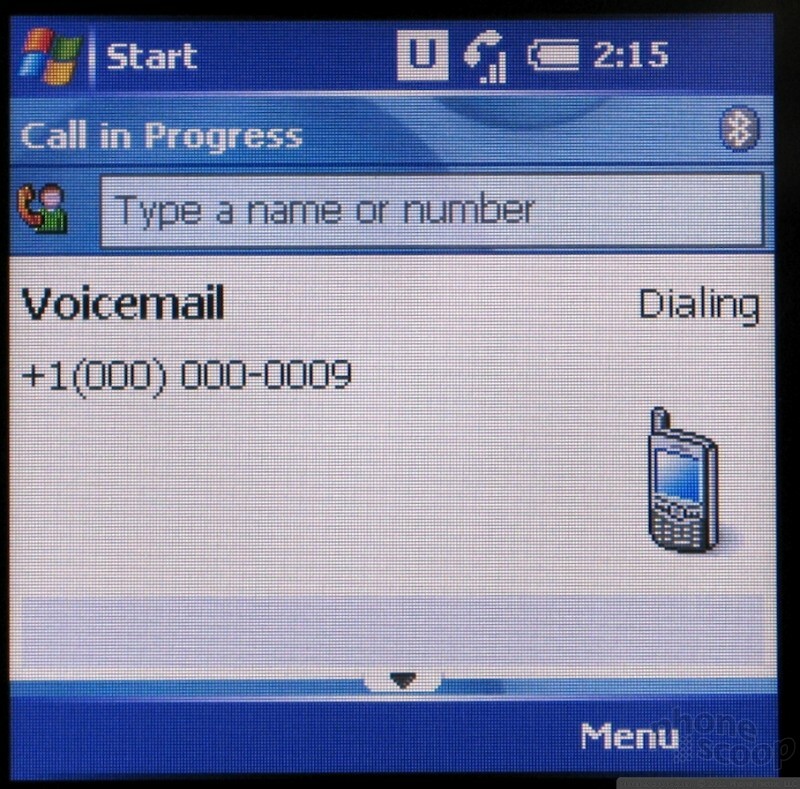 Although there are two separate labels on the box to close applications or windows ("ok" in some cases, an "x" in others), you can also use the stanard phone convention of exiting and returning to the home screen when the end key is pressed, which is a welcome change. Another press of the end key at the home screen will turn the screen off and lock the keypad. 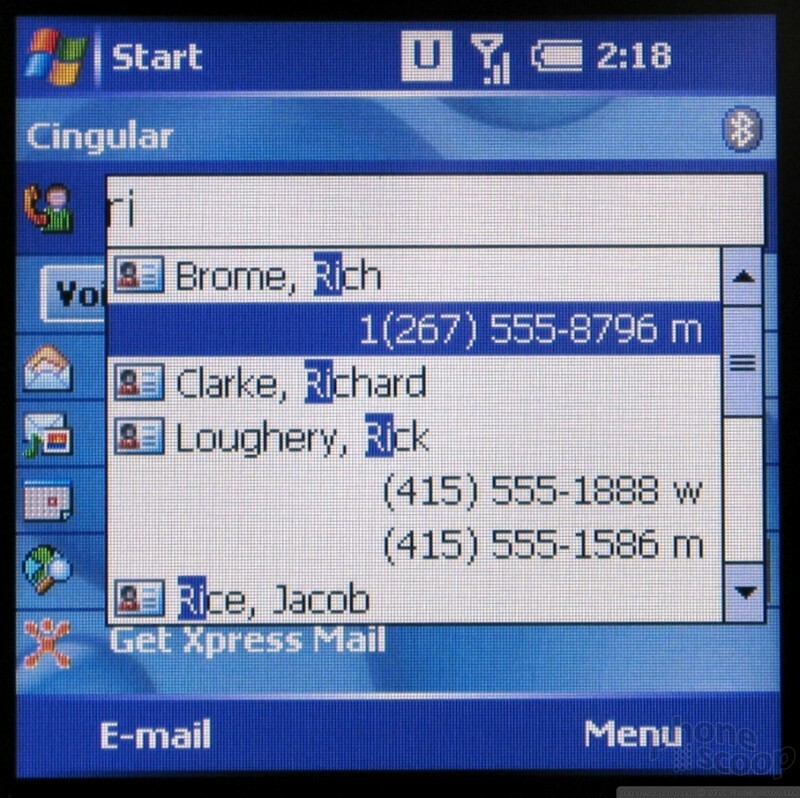 Although it is not normally available on Pocket PCs, Palm has added a feature that lets you start typing in a name from the home screen to search through the contact list and dial a number. 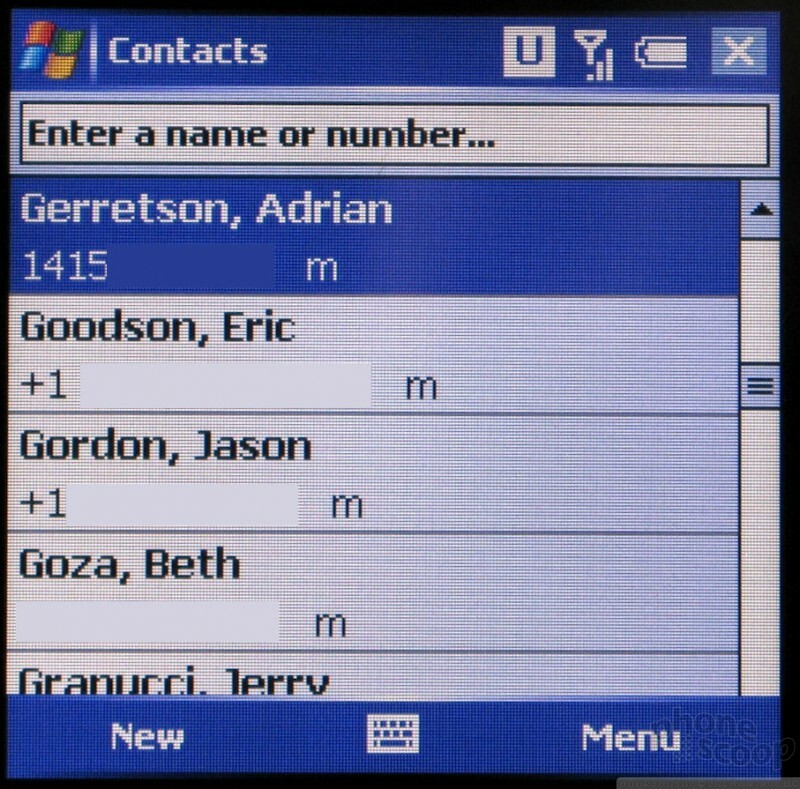 If you want to do anything other than call that person, you can either take out the stylus and tap and hold (the Pocket PC version of right click) on the contact or just skip it and go to the contacts applications. Once you enter the contacts application from the right soft key on the home screen, you can again start typing to filter through your contacts. Each contact displays a name picture and phone number or other current contact method in the contact list. Selecting a contact opens up a summary that can include all the data an Outlook contact card can hold including 3 address, more than 10 phone numbers, 3 email address and many other fields. Information can easily be added or changed, and both Photo caller ID and ringtones can be set from the contact card as well. Pressing the Send key when on a contact with a phone number selected will switch to the home and populate the dialer widget with that phone number. The Send key must be pressed again for the call to be dialed. 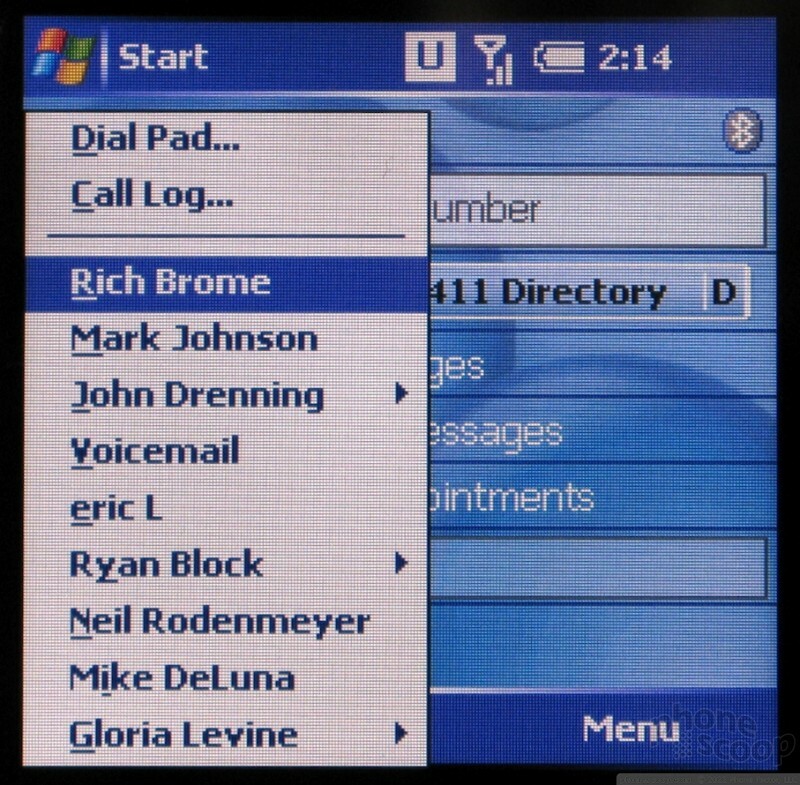 If you hit the call key from the home screen, a list pops up with recently dialed contacts as well as shortcuts to the call list and phone dial pad. Unlike other Pocket PC phones, the Treo doesn't treat the phone as its own application so much as an accessory to other applications. Even with the shortcut, it's difficult to find the phone dialer, making it tough to dial numbers that aren't in your phone book. 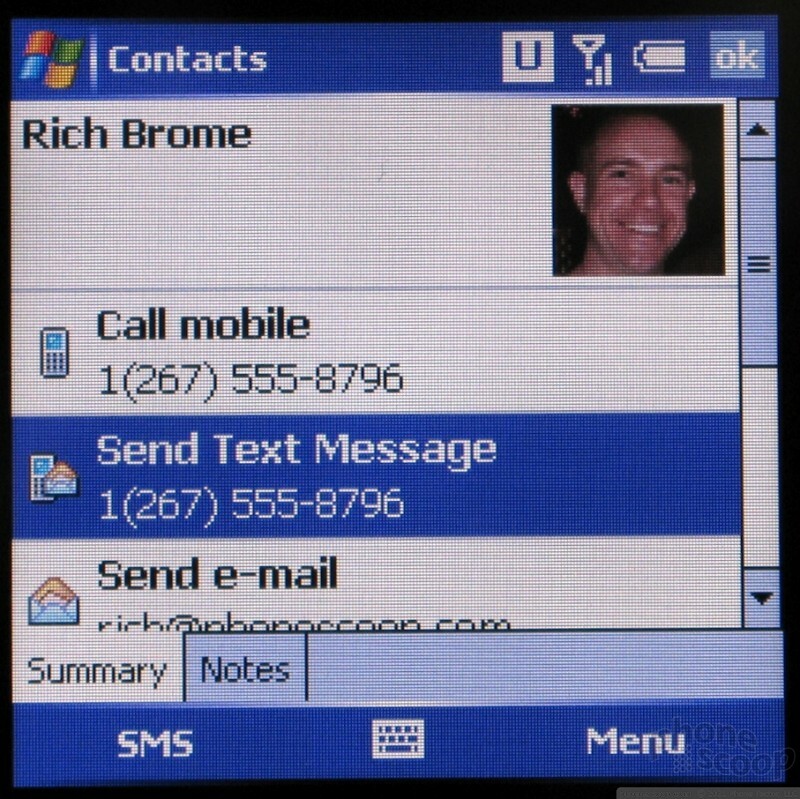 Furthermore the Treo 750 ditches the standard PocketPC in-call screen (with large on-screen controls for functions) in favor of a more Smartphone-like screen that displays the caller's name and hides all functions in the options menu. 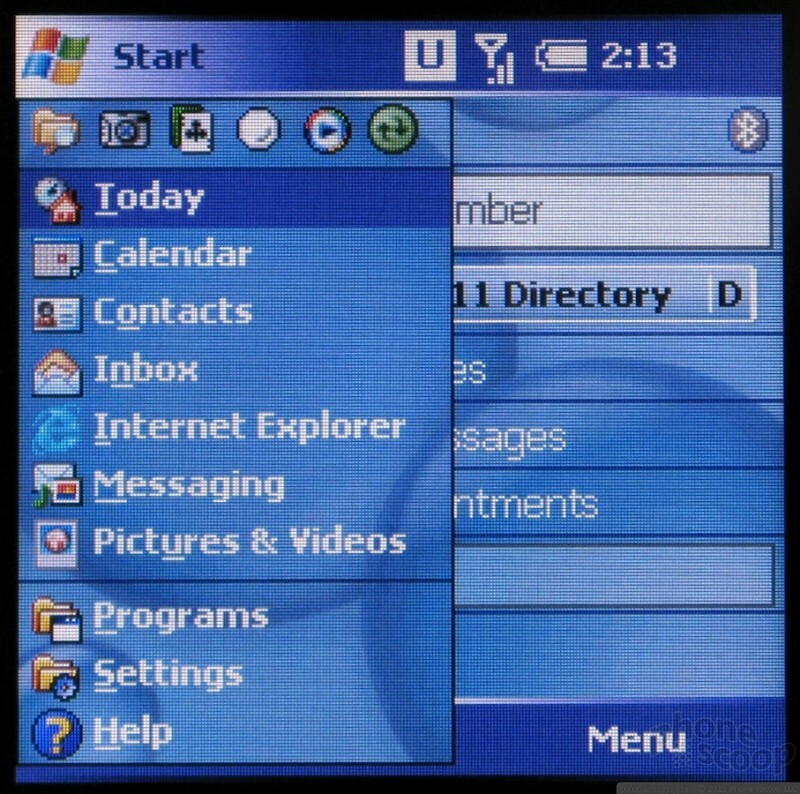 This change is shocking considering Microsoft originally copied the on-screen buttons from Palm when it launched Windows Mobile 5. 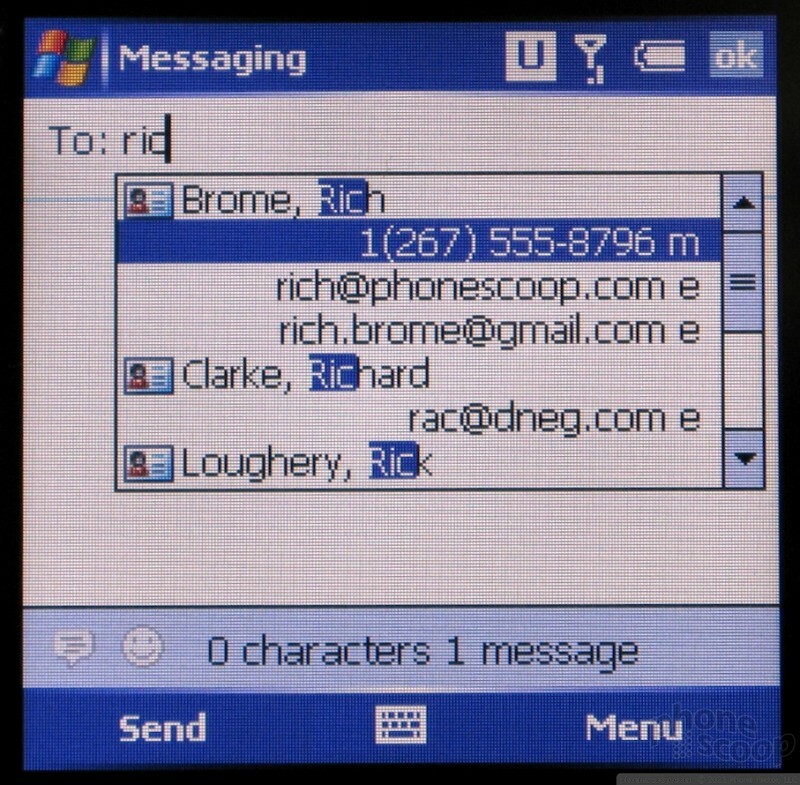 Unlike other Windows Mobile phones, there are two messaging applications on the Treo: one for text and multimedia messages and a separate one for email. The email application is the Inbox that will be familiar to Windows Mobile users, only it's no longer the one-stop-shop for all messages. As on other devices, the Inbox can sync with an Outlook or an Exchange account, or can be configured to retrieve mail from a POP or IMAP account. It can take advantage of the new Exchange push email if your company makes that available, or can be set to automatically retrieve mail at regular intervals. There is a running count of new mail on the home screen which can be used as an easy shortcut to the Inbox. In addition, when mail arrives, a notification pops up to take you to the new messages as well. 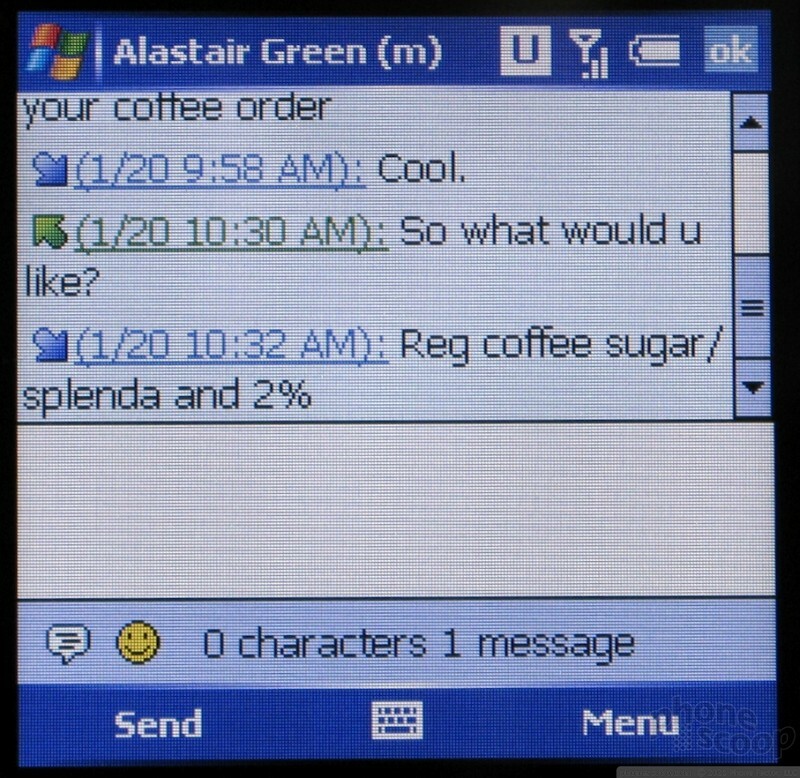 The Messaging application is a Palm exclusive that displays SMS and MMS as threaded conversations. It keeps track of incoming and outgoing SMS and displays them like IM chats by person, instead of just as a list of incoming messages. This display makes much more sense than the traditional text inbox. Using the Messaging application to compose messages is easier than the old Inbox method. Right from the application you can quickly tap the "New" soft key, start typing out a name, and be composing a new text message just by pressing the down key. 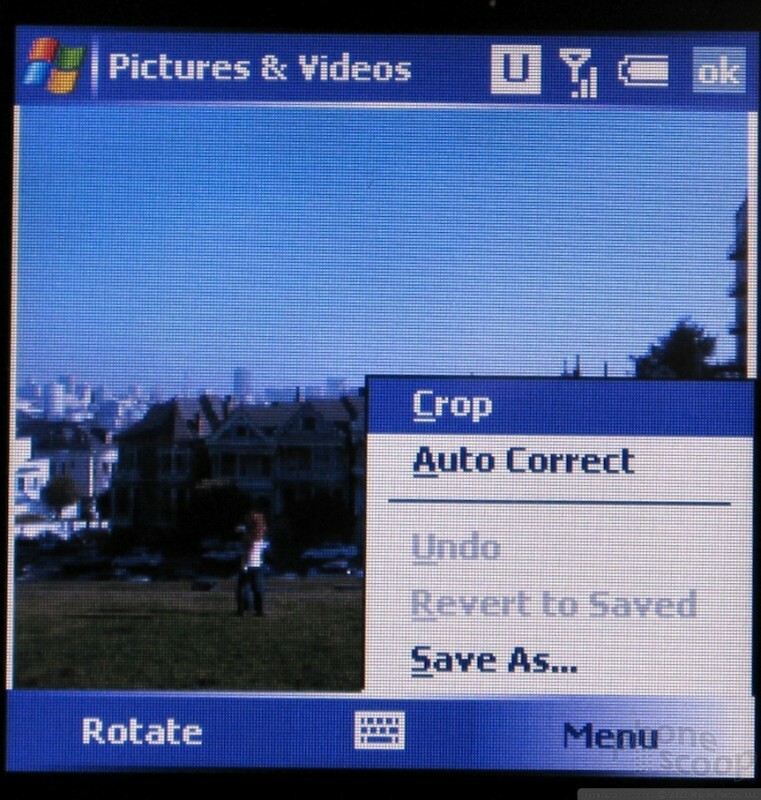 The Treo 750 uses Microsoft's default camera application, which is rather simple and straightforward. 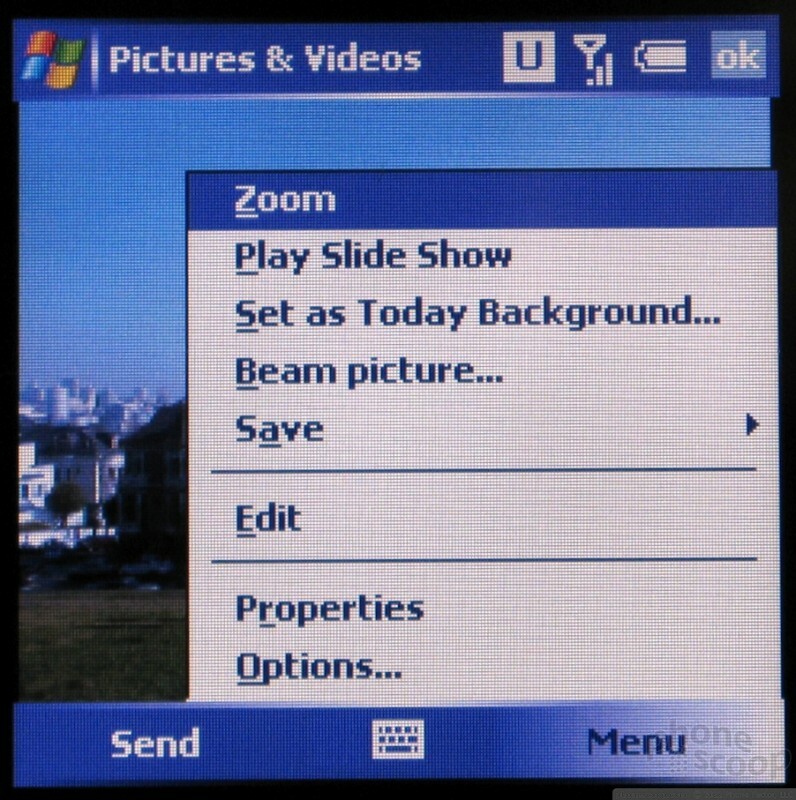 It takes about 2 seconds to start up and then you're ready to just hit center-select to snap a picture. There are no other controls and very few options. 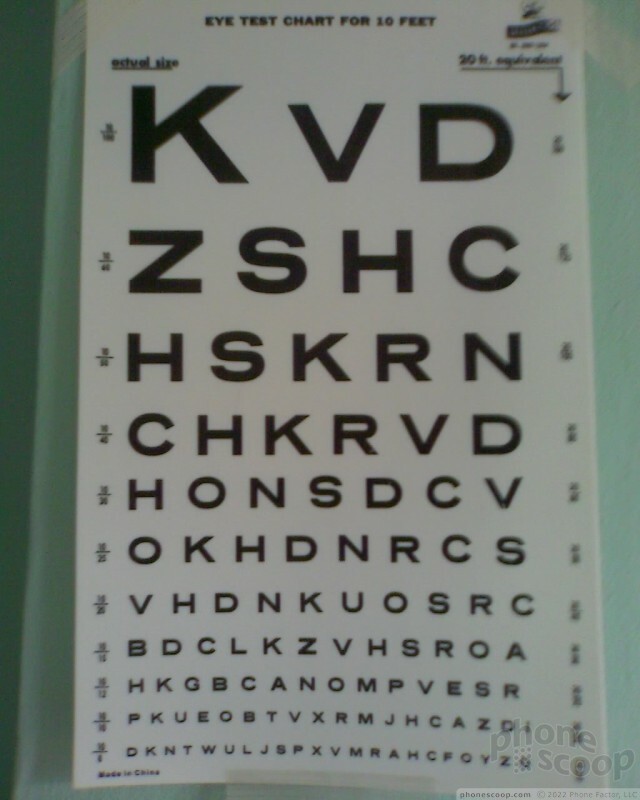 All the program offers is a variety of resolutions and digital zoom choices. It takes about a second for the camera to actually snap the picture after you press select, so be sure to wait for the shutter sound before moving the phone around. The picture is quickly saved and you are shown a review screen which provides a number of options to do something with the picture. 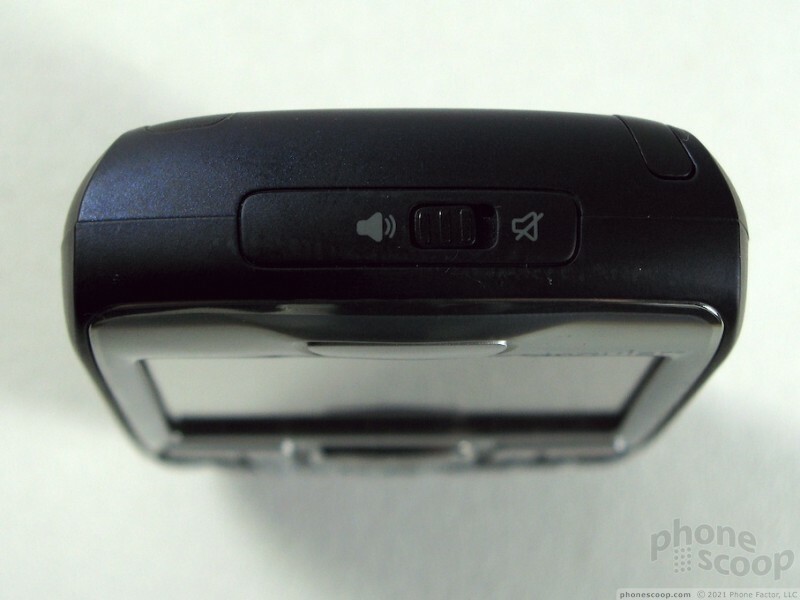 The video recorder is even simpler as the only option is video resolution; there isn't even a review screen. The video is saved as soon as you press Stop and the device is ready to take another video about a second later. The gallery application is fast and rather full-featured, and uses the touchscreen well. 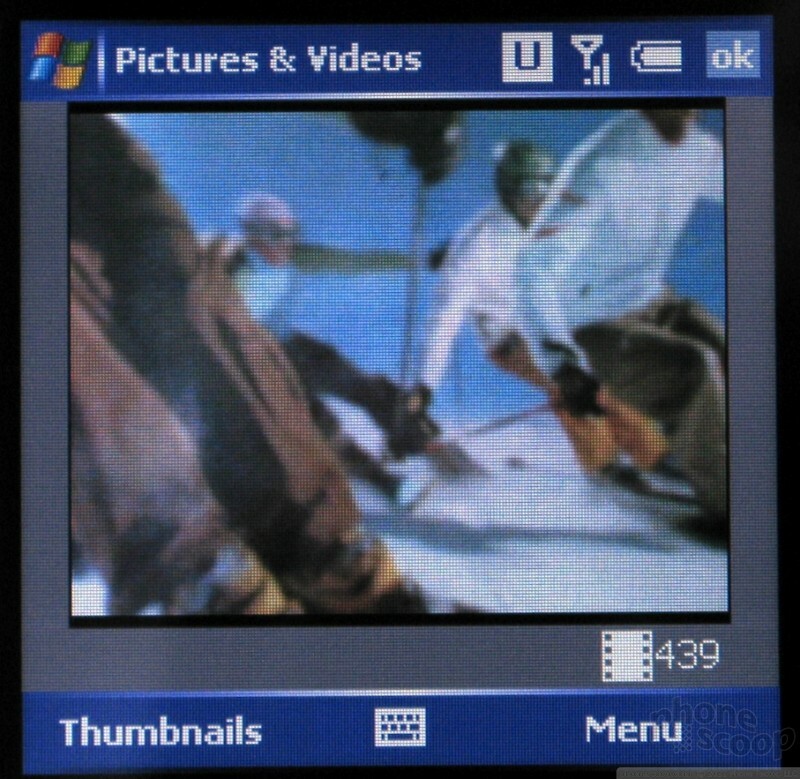 The thumbnail list provides a grid of 9 clickable thumbnails per screen. From the thumbnail list all major file functions - such as sending, copying, deleting, and more - are possible. Tapping a picture brings it up in single-picture mode. From here you can still send a picture, but the focus shifts to viewing and editing. You can zoom in on a picture, play it in a slide show and do minor editing like rotating, cropping and adjusting the levels. 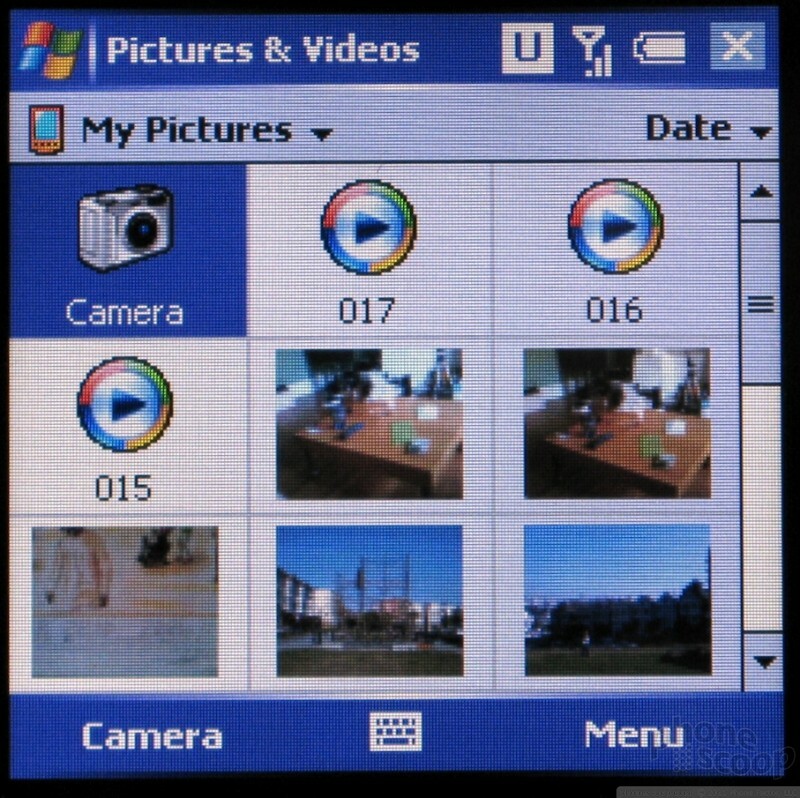 The same application can be used to view videos recorded with the camera. The 750's camera has 20/50 vision, which is average for a 1.3 Megapixel sensor. It has excellent color in most lighting situations, although it has a hard a hard time when the sky is clear and the sun is not directly behind you. 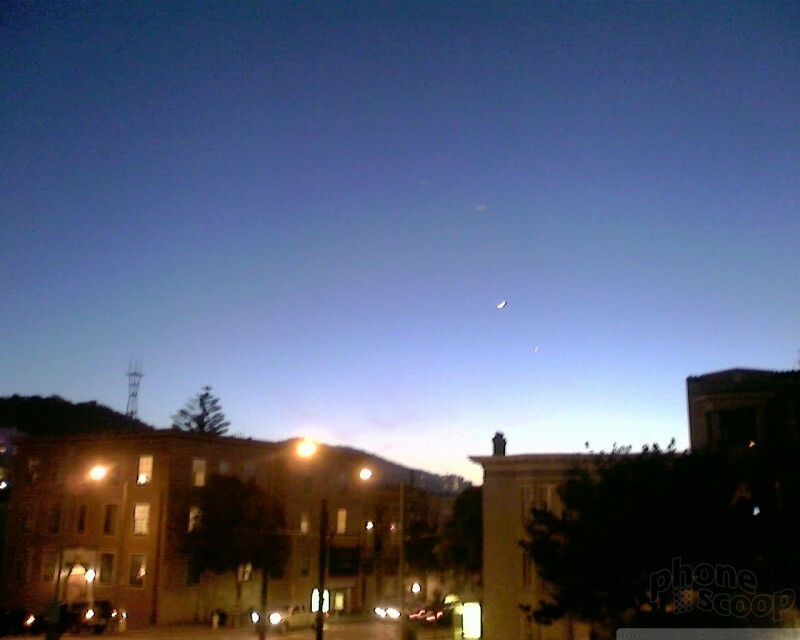 It performs much better in low light situations than other similar cameras, especially considering there is no flash. 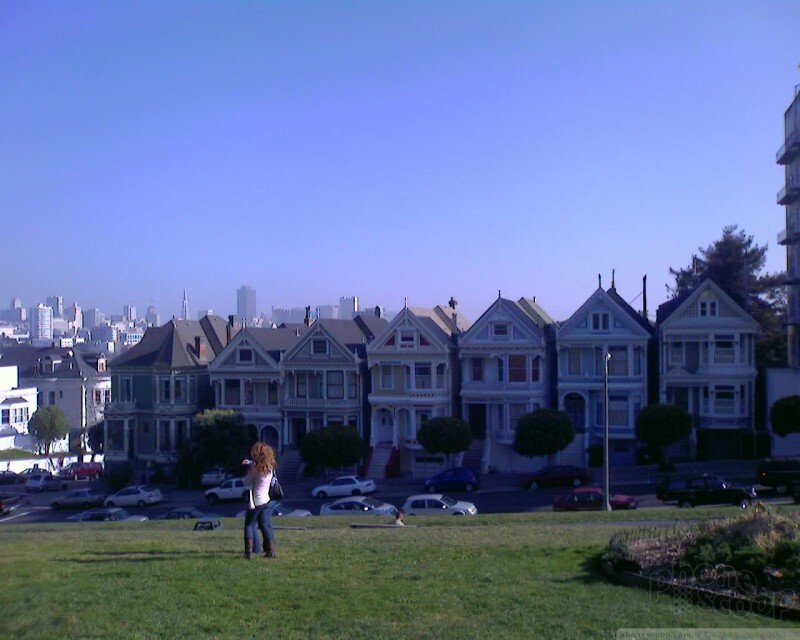 Video, while grainy, has fairly smooth motion. It has much higher contrast than the photos, which hides details in very bright or very dark areas. 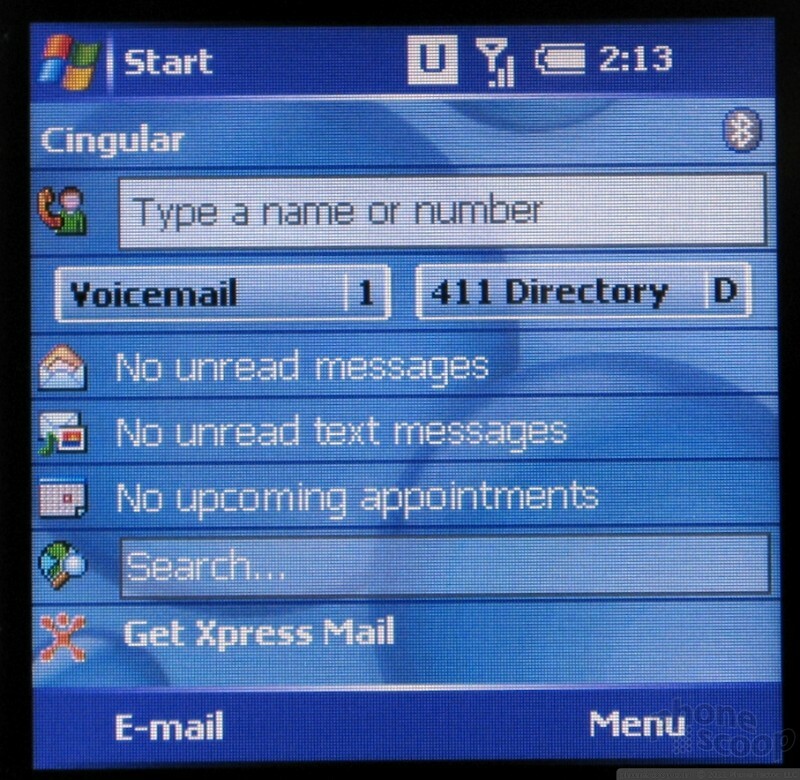 Internet Explorer for Windows Mobile is a full-featured HTML and WAP browser. Using EDGE or 3G (UMTS not HSDPA), the browser can be used to access most sites whether they are formatted for mobile devices or not. Explorer has a number of page formatting options. It can render the page as it would appear on the desktop, which typically requires both horizontal and vertical scrolling. It also has a one-column view, which will display columns one after another in a single column view. This view also resizes text and images to best fit the screen size and orientation. A third mode tries to find some middle ground between the two extremes. 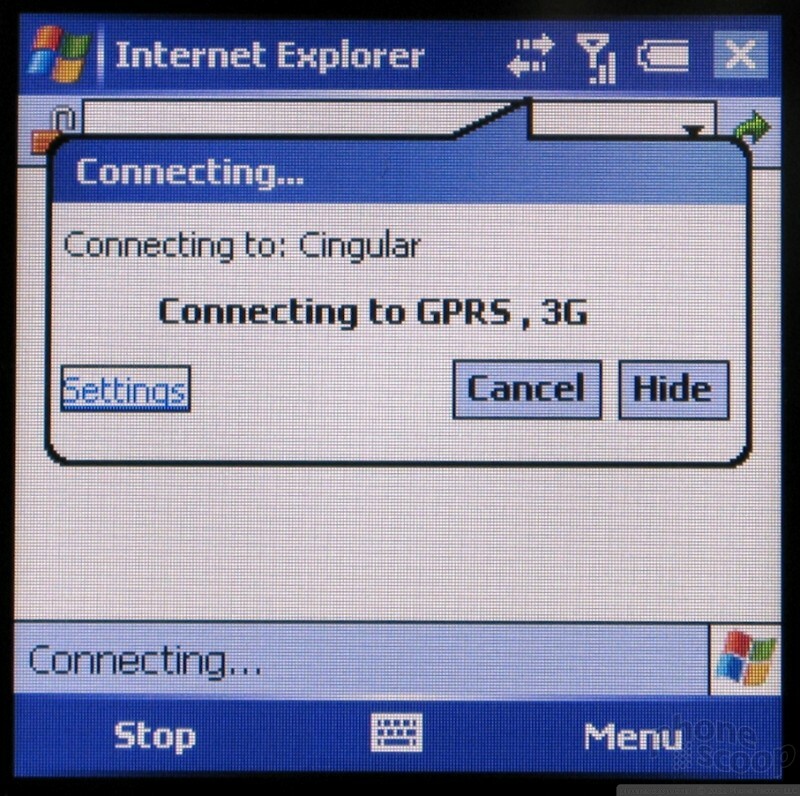 Even browsing on EDGE, the 750 was relatively snappy, when browsing at 3G speeds, it was difficult to tell the phone was using the slower UMTS protocol as opposed to HSDPA. Though the speed was nice, the screen was way too small for extended browsing. Even short paragraphs required scrolling. We already mentioned that the look of the home screen and menus can be changed with a theme. In addition to the home screen, the theme affects the color and style of the status bar and menu bar throughout all applications. Although it requires more steps than one would expect, the Treo 750 can play any MP3 or WMA as an ringtone. After copying the file to the 750, first you must go to Manage tab in the Sounds settings panel and add the file to the list of tones. 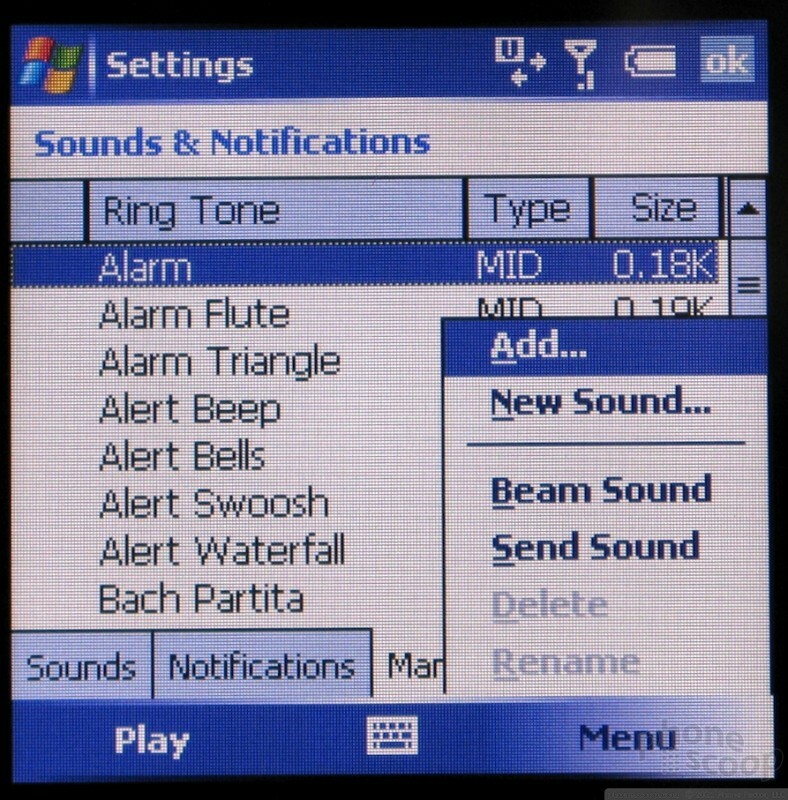 Then you use the Notifications tab to choose what type of alert you'd like to set that sound for. The phone comes with a variety of simple MIDI tones including the ever-popular Treo bells ring as well as the Cingular theme. Microsoft has finally caught on to the fact that phones now serve as watches, but they've hidden the preference that makes the Treo useful as a watch. By default, the time is only visible from the home screen. Despite the large status bar across the top of all applications, the time is not displayed anywhere else. However there is a tab in the time and date settings that will make the clock visible in the status bar all the time. When the screen is turned off, all the keys are locked. There is no key to press to get a clock to appear. The only way to turn the screen back on is a quick press of the power button. Like many other Windows Mobile phones, the 750 is capable of far more Bluetooth functionality than the phone reports. It supports headset and hands free profiles, and paired with our headset easily. Even though the phone doesn't tell other devices, it also supports OBEX and DUN profiles. We were able to send and receive files of all types from Vcard to MP3. Getting DUN to work was more difficult but still possible. 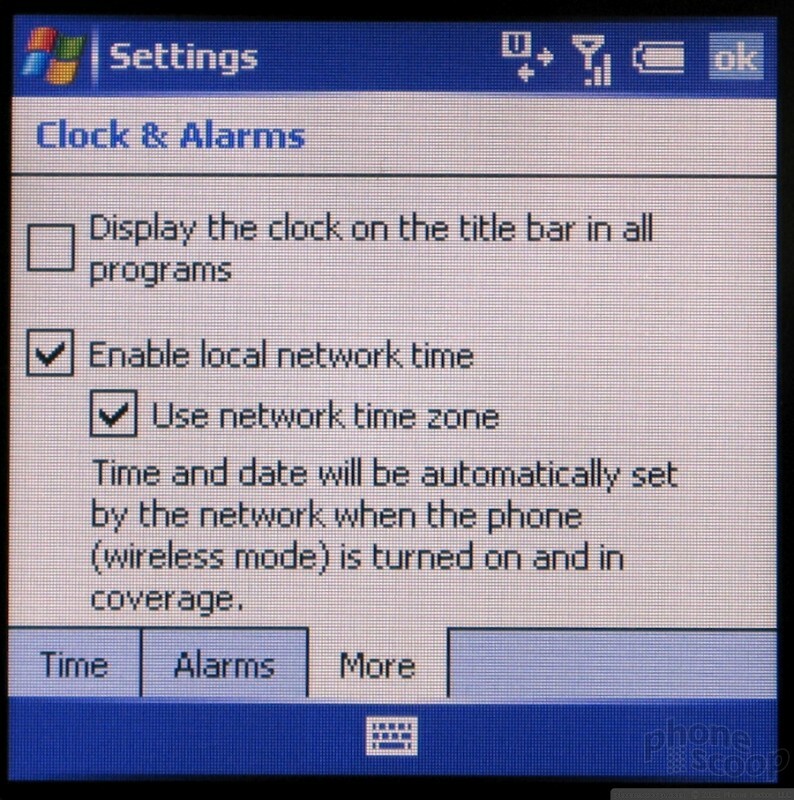 There is an alarm clock application which can store multiple alarms, each with its own unique settings for what day of the week to sound and what sound to play. The alarm cannot turn on the phone to sound an alarm. The calculator uses the touch screen to emulate a simple calculator, which makes it very easy to use. 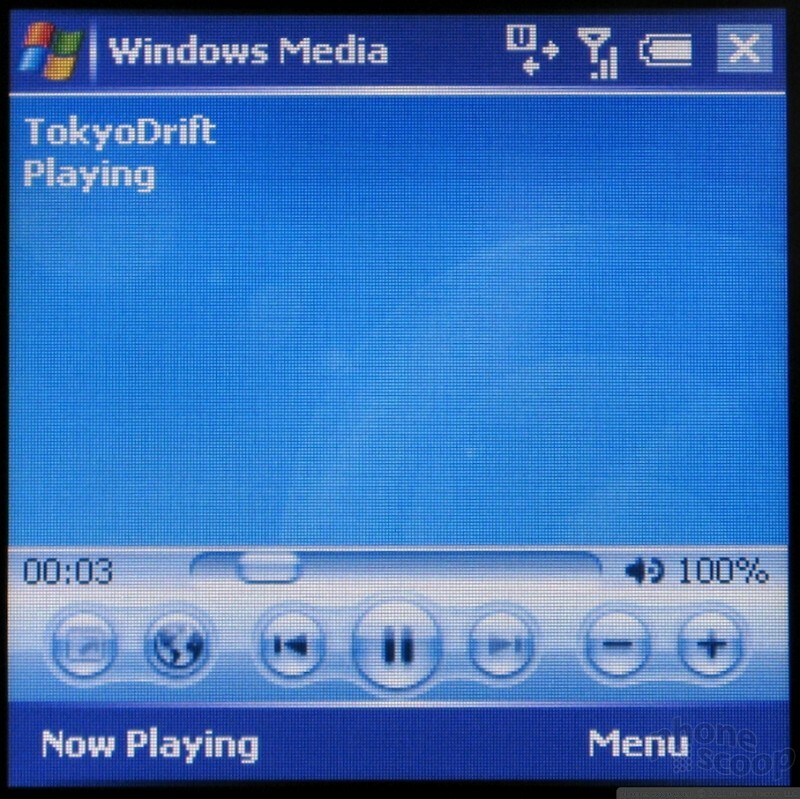 Windows Media player is a robust application for both audio and video files. You can assign custom D-Pad and button functions for it when the player is in the foreground. It can play WMA, MP3 and most common audio files, and WMV or 3GP videos. or go to Google Video or YouTube for more viewing and sharing options. When a cell phone is good at everything but making phone calls it's difficult to recommend it. 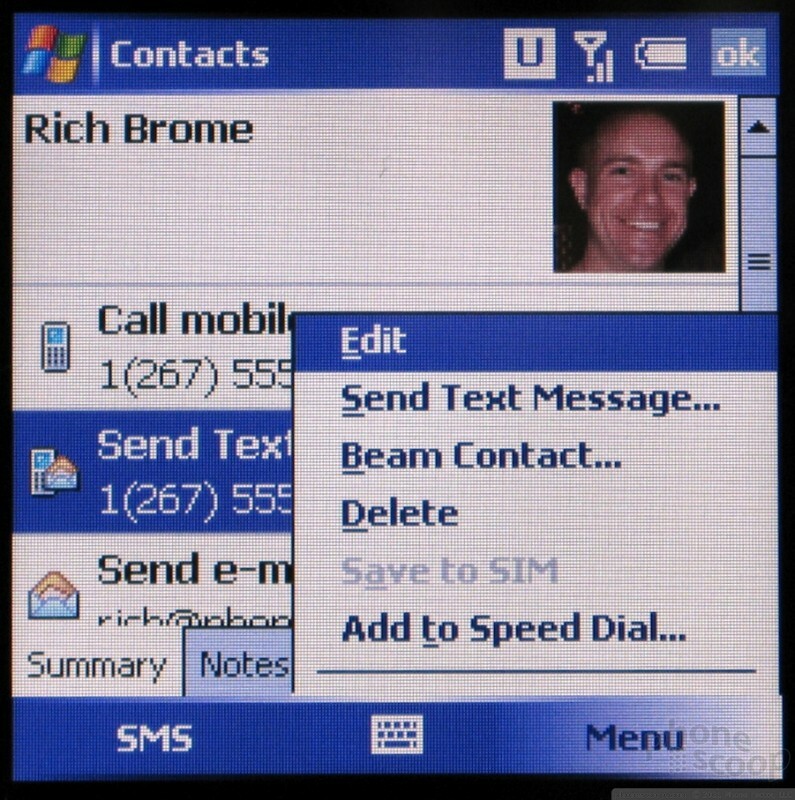 This is unfortunate because additions like contact search from the home screen and threaded messaging make the Treo 750 one of the easiest to use Pocket PC phones. Since no one else is reporting the problems we've had, it is possible the Treo 750 will work well for you right now. However if you're not willing to take that chance, you may want to wait to see if Palm releases a firmware update for it. Even if they don't release an update specifically to improve the radio performance and fix problems, they have stated an update will be coming to upgrade the 3G to HSDPA. It is possible such an update will also fix our dropped call issue as well. In Depth coverage of CTIA Wireless IT & Entertainment 2006 in Los Angeles. Hands on with the Treo 750, Casio G'zOne, HTC S620 and Hermes, BlackBerry Pearl, Nokia E62, and more. A quick hands-on tour of the DirecTV Now app for Android. (An iOS version also available.) This is the boldest attempt yet to bring all of the major network and cable content to cord-cutters, and the full service is available from mobile apps, in addition to home streaming boxes. Treo 750 Battery Life - The Real Story? I am a Treo 650 user and am considering an upgrade to the 750. I have read conflicting reports on battery life. I have talked to two 680 users who said their battery life was unacceptable. I am curious if the 750 is really any better? I am receiving a fair amount of email during the day. Thanks for your opinion. I have also noticed the dropped calls. It only happens when UMTS is engaged. I have set the band to GSM instead of auto. I have not had one call drop while on GSM. I hope that the update for HSPDA will correct this. You should test furthur selecting between the GSM and UMTS band. As the Treo 750 is one of the best devices I have ever used. iDen: Original Nextels (Duel Set) maybe i205? yes, i have had several dropped calls since Ive started using the 750. makes it hard to do business on the phone. Im returning the 750 because of it. Here we go again. Everyone loves the treos and there layout, but remember these are phones first and if the phone part is terrible that all the other pros of the phone dont matter. I mean, TWO Treos that drop calls in the same vicinity? Seeing as no one else has reported these problems, it seems like hardware is fine...it's just your the location of the test. So here goes nothing, can someone please explain the difference in Microsoft operating systems on these two different phones. I am aware there are various versions of MS for phones but can't make out the subtle differences. Every other qwerty out there now is a lot thinner. Why does Palm insist on lagging behind? They might as well call it the new Palm "Brick" because that's what it feels like in your pocket, 20% lighter or not. Is it so hard to slim this device down? 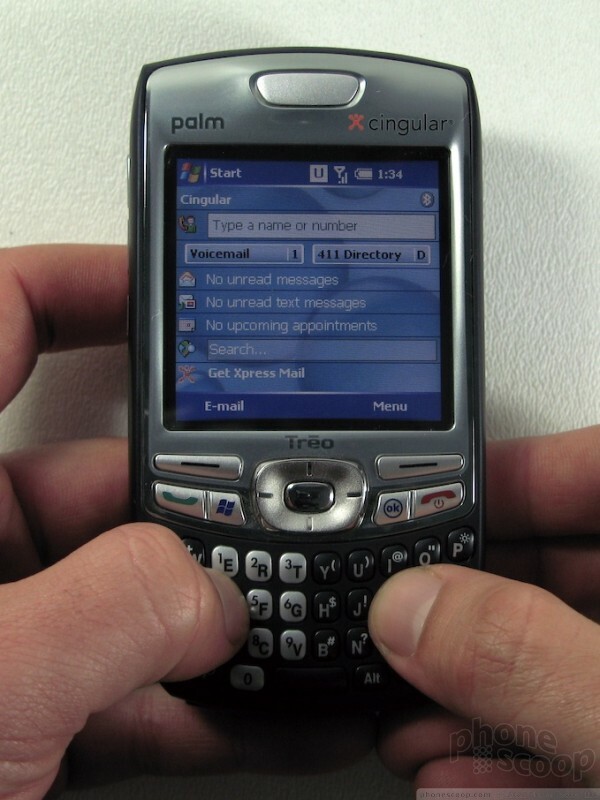 If Motorola can do it why can't Palm? I would have bought this device a long time ago to sync with my Mac... if it didn't look like luggage. Here's all we need to know: The iPhone cometh. All fear the iPhone. Cheap plastic buttons, lame Windows Mobile and Palm OS, weak media players and stupid stylus pens: start making funeral arrangements now. All you PC loyalists still hanging on to the 80's metal dream need to wake up and see that Nirvana's "Nevermind" will soon be the end of you all. I'm sure this has been discussed before, but I just wanted to hear some more opinions. I have 15 days left on my trail period and don't know enough about toe treo 750 to make the switch. The 8525 has Wi-Fi capabilities, to me this is a huge perk. Although i don't rely on the internet like most buisness users do, I am always somewhere with a hot-spot and to me it its just free internet. Why pay for slow internet when you could hook up to fast internet for free? I am an experienced Phonescooper and user of logic; I know this will be subject to preference. 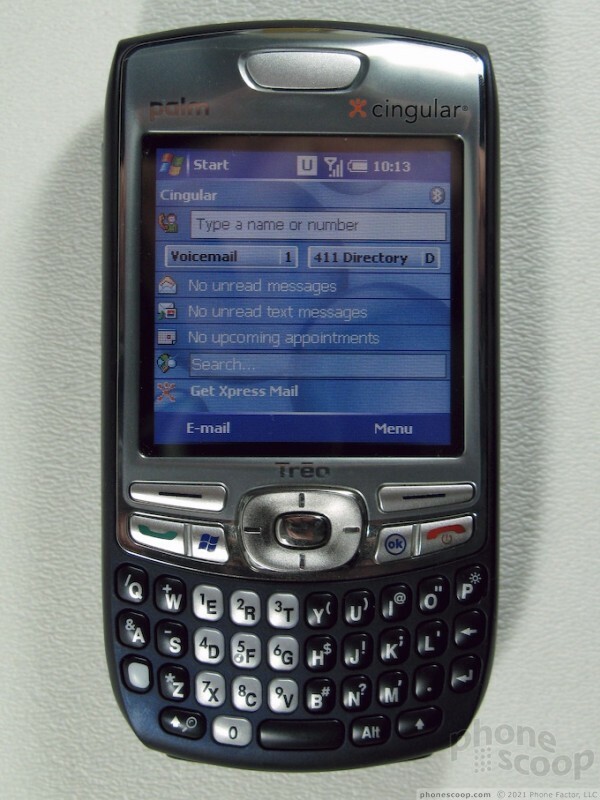 Which device do you think I should get, thus is better, the Cingular 8525 or the Treo 750 (after the HSPDA upgrade, of course)? I have been there and made that choice. I had the Tytn (8525) and it is powerful includes WIFI etc. I am considering upgrading to a PDA phone. I am in the medical field and need to put multiple applications on the phone. Things like patient interview and pharmacy programs. I am a bit mixed up on the different forms of Microsoft PC available on phones. Need something similar to what runs on my Dell PDA.